The latest "De La Soul" edition of the Nike Dunk Low Premium SB hits stores this weekend. The D.A.I.S.Y. age returns for one more release in 2015. 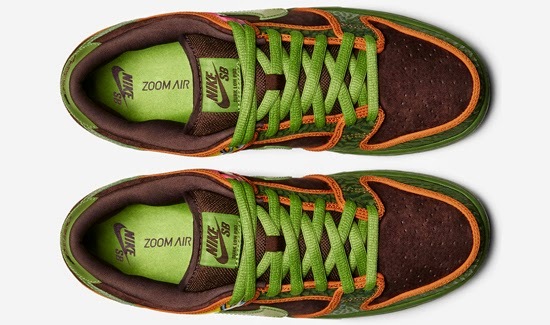 This time taking the classic "De La Soul" Nike Dunk High SB and converting it into a Low. They come in the original safari, baroque brown and altitude green colorway. Featuring a brown-based suede upper with "De La Soul" graphics and elephant print detailing. A limited release, look out for them at select Nike SB accounts worldwide on Saturday, May 16th, 2015. Retail is set at, $125. Enjoy the official images below of the "De La Soul" Nike Dunk Low Premium DLS SB in safari, baroque brown and altitude green. If you're interested in picking these up when they release, check in with your local spots to see if they will be receiving them. Those of you looking for a pair now can, grab them from eBay here.